Watching their tummies grow month after month, I find it incredibly photogenic. I find that 7 months pregnant is usually the earliest I want to capture them as that is when their shape starts looking the best. After you plan the shoot, experimenting with different methods and locations can make them look gorgeous and provide some great memories. I wanted to share many different images and ideas on how I go about trying to capture these beautiful bellies in so many different ways. Shooting outdoors is completely different than shooting indoors, and each have their difficulties. Posing is so critically important and having her look down, with her eyes closed and her hands wrapped under her belly gave me just what I was looking for. Many times I have ideas in my head before the shoot and this is key as those big bellies make women pretty tired. It’s best to come prepared with ideas in advance. When I’m shooting in the studio or someone’s home, I want to have some good light sources so that I can experiment with different techniques. In the shot above, and in some of the others I will show, I love using my Photoflex Starlite QL Continuous light usually in my Silverdome softbox. Most of the time I have a grid in front of the softbox to give me more directional light and focus it just where I want it. You can see in the shot above that I also had her in a similar position to the one with my cousin on the beach, looking down and her hands under her belly. When your subject is relaxed, it definitely makes for a softer image overall, which is what I am usually going for. In these four photos above, I also used the Starlite QL while trying different poses and ideas. I use all kinds of backdrops and fabrics when shooting images like this but as you can see, I really love how the female form works against black. It really isolates their form and beautiful skin and you end up with nothing that is too distracting. And as you can see, much of the time their eyes are closed or their head isn’t necessarily always in the image. There are so many different ways to capture images like this and I just love playing around, as there are no rules and not a lot of people out there that specialize in this kind of photography. The skies the limit and it’s always a different experience every time. Often, window light can be just what the doctor ordered. 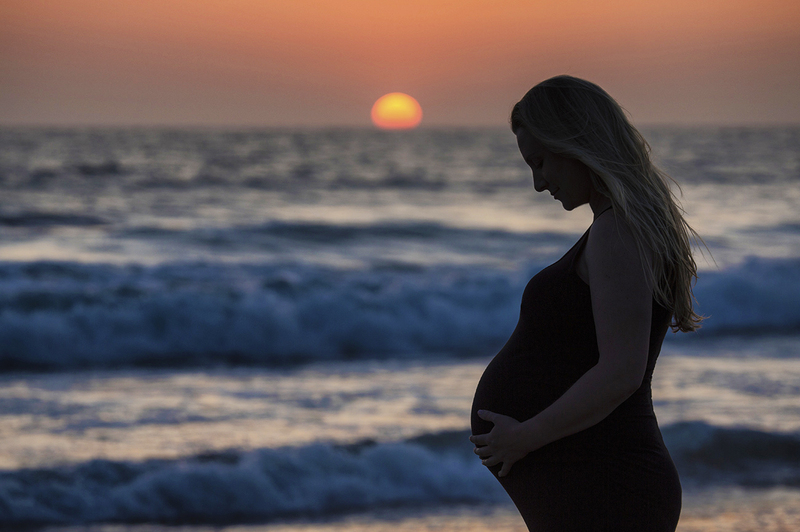 During the day, there are so many different ways to harness the light and capture exquisite pregnancy images. Your subjects can be close to the window as in the image above of my friend Laura, or they can be placed further away from the window and capture the soft, ethereal light quality. The advantages of working with window light are many. You can shoot images in different rooms of your home and you don’t really need much equipment. I do use reflectors and diffusers with window light quite often and my Photoflex gear always helps me soften or bounce light just where I need it. Whether it’s filtered light through blinds or flat light in the bathroom, window light is one of my favorite light sources for capturing these beautiful bellies! If she wants, taking her outdoors can produce some of the best images possible as you can take advantage of the beautiful light at different times of the day. You can also photograph her family with her and capture some beautiful family portraits. From my experience, images with their husband, like the image above, seem to be timeless. If they have other kids, I love trying to use them in some beautiful ways in some of the photos. So often, these tend to be the ones that are framed and kept throughout the house. You have to do your scouting for the best light and best locations outdoors if you want to capture something that they will absolutely love. Below are a few different examples of using beautiful light outdoors. Don’t forget to always capture horizontals and verticals, as often you might not know which one they will like best. In the next few images of beautiful Tiffany on the beach in Santa Monica, it shows me shooting in the direction of the sunset but I realized I wanted another light source on her left side. I asked her husband to hold up a Photoflex translucent umbrella with my off-camera flash shooting through it. Using my radio transmitter on camera, I was able to capture just what I wanted. The last image produced exactly the feeling I was looking for. When you balance your exposures for the front and back light, you can produce stunning images. And having some good gear is crucial too! As I mentioned earlier, I really love using the combination of my Starlite QL with my Silverdome & grid but I also love using them with my Photoflex 41x74 inch LiteDisc. I have created some beautiful images by incorporating all three products and the key to success I feel is experimentation. You can see in the two images below how I set things up for shots like this. I shoot towards the softbox with the diffuser in the middle so that I can create some soft silhouettes of their beautiful curves. I also play with camera blur at times just to try something different. Photographers are artists so play with that canvas. This photo below use the Starlite QL and Silverdome without the large diffuser. You can play with the distance of the light from your subject to get the quality and look that you want. It is the exact same set up as the image above except I added a softbox in front to light up Leslie and Jake. The diffuser has another light coming through behind to give me the soft white backdrop. The image below shows the Starlite QL and the Silverdome shooting a very cool couple that wanted something soft and sweet. 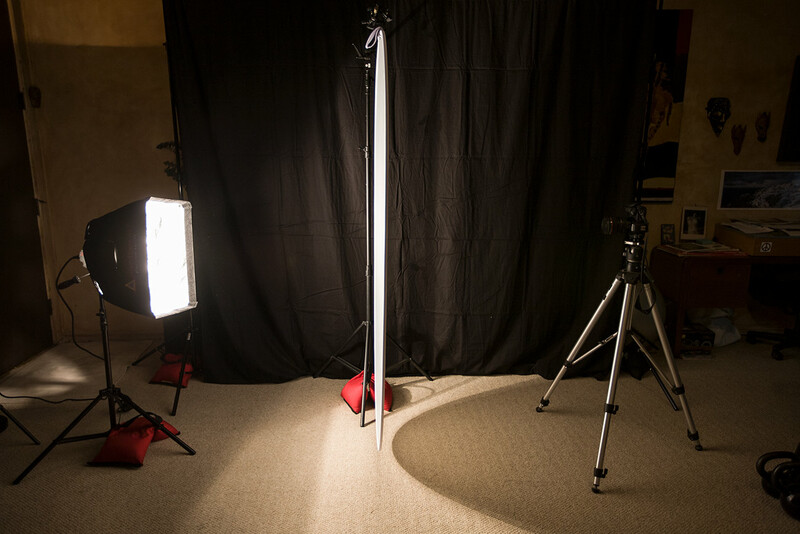 The second image below shows the set up that night with the light coming from an angle. This image was shot without the diffuser at all and once again shows the versatility of this light set up. There is a lot of trust that builds up on shoots like this. When your subjects are relaxed and also realize how special the images might turn out, it often shows in the photographs. You can also use fabric in different ways and I love looking for great fabric at fabric stores. I love red, orange, yellow and green and the best to buy is called Chiffon. It literally floats across the body and photographs incredibly well as you can see in this next photo. Capturing timeless images of women and their beautiful bellies can be incredibly rewarding, not just for you but for their entire family. You can see in this last image below that women with babies in their bellies can be beautiful. 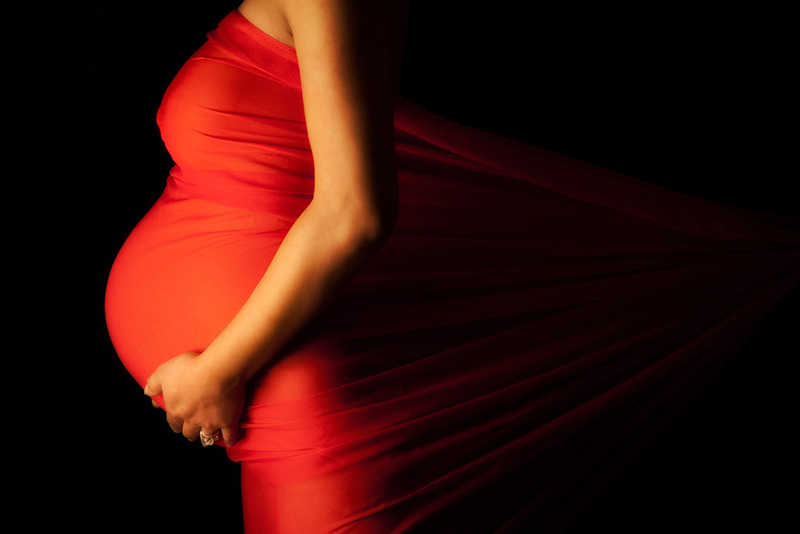 I have been photographing pregnant women for as long as I can remember and I never get tired of it. You just have to think outside of the box, have some decent gear with you if possible & look for great locations. After that, it’s time to create some magic. Have fun…! The first shot is absolutely amazing! I wish I had done something like that with my wife! Thank you Eric. 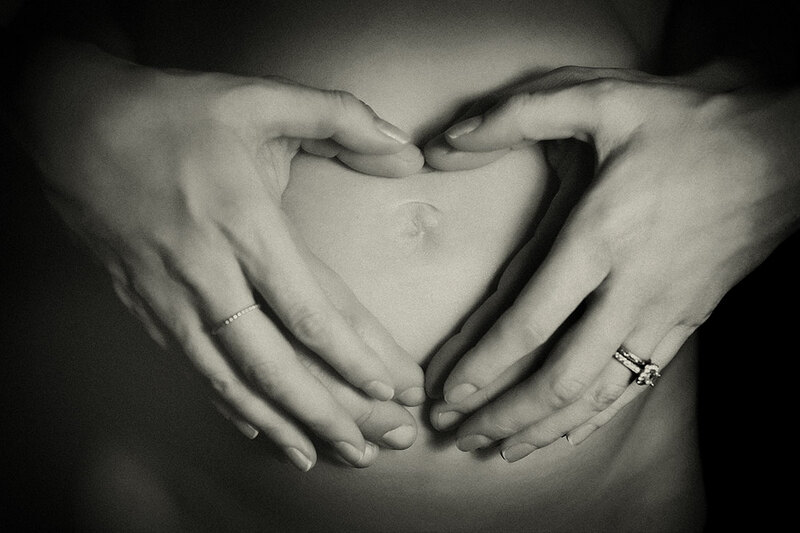 Love shooting beautiful bellies and it’s all about experimenting…. !